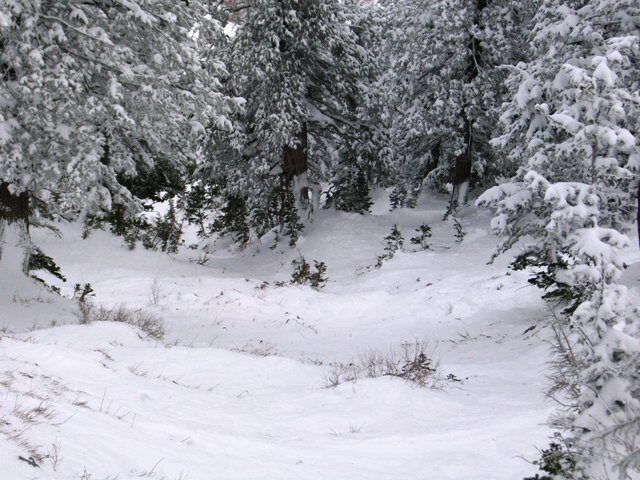 Report compiled by Snowbasin Snow Safety: Frank Waikart, G.R. Fletcher Reviewed and Published by UAC staff. Events leading up to the accident: The 2009-10 season overall had lacked much of the snow that the local riders have grown accustomed to. The powder days up through mid January had been few and far between. The month of January was very dry and the snow conditions were thin and very worn out. There was very little enthusiasm for any travel off of the main groomed runs. So when there was a report of a large storm, anticipation for new snow was definitely high. The riding conditions improved each day as the snow continued to fall. By the morning of the 24th 36 inches of new snow had made the riding conditions within the resort excellent. For the backcountry there was an avalanche warning in effect and the danger rating was extreme. On the 24th of January, Ben Pett and Todd Bell had been skiing together all morning. Both of them were familiar with the area as they had been skiing at Snowbasin for some time. Todd was a former employee of the resort in the mid 90’s and had good knowledge of the terrain. Todd and Ben decided to head up the John Paul lift and make a run in the No Name area. No Name is known to be the premier powder terrain at Snowbasin ski resort with a near continuous vertical drop of close to 3000 feet. Adjacent to No Name is easy access into uncontrolled backcountry terrain of Hells and Coldwater Canyon. On the lift ride up John Paul Ben stated that he and Todd had a discussion about how dangerous the conditions were in the backcountry, and because of these conditions their plan was to ski adjacent to the boundary in No Name all the way out to the bottom of the Lower Pyramid. They travelled together to near the top of No Name peak where they caught their breath and put their skis on. Once more they discussed their plan of skiing near the boundary and staying in bounds. This was the last place/time Ben would see Todd (approx. 13:00 to 13:05). Ben pushed off and skied a line next to the Gazex exploder (No Name drain) and stopped in the trees on the skier’s left to look for Todd (near the ridgeline and the top of “Lust”). He looked uphill, but didn’t see Todd. He assumed that they had just gotten separated, so he continued down the run, skiing out the Lower Pyramid and coming out at the power station. He stated he reached the bottom around 13:15. Since Todd was planning to make this his last run, Ben wasn’t immediately alarmed that his friend wasn’t there (or hadn’t waited for him). Ben was confident that Todd would be OK because he knew the mountain very well and was an excellent skier. Ben then called a friend, found out what car Todd was driving, and discovered that his car was still in the parking lot. At this point, he became alarmed and notified dispatch that Todd was missing. By the time he contacted the Ski Patrol they were well into the recovery operation. Ben stated that Todd was not wearing a beacon. Todd did have a pack, but likely was not carrying a shovel or probe. Ben was wearing a beacon. Jason Warner a friend of Todd’s also walked into dispatch and stated that Todd was a good skier. He knew the area well, both inbounds and out of bounds. He was very experienced in the area. He estimated that Todd had been skiing in Hell’s Canyon hundreds of times. Information from group of snowboarders on scene: On their first “lap through No Name,” a group of 5 snowboarders left the ski area at the top of No Name, passing the Forest Service brown sign. They noticed 4 or 5 tracks ahead of them, likely snowboard tracks. None in the group carried beacons, shovels or probes, although they usually do have all three with them (gear was in the car). Unaware if they had checked the avalanche advisory that day. They rode down the traditional “Sloth Ridge” route and likely rode down “Pride” into “Anger Confluence.” At this point, they noticed fresh debris from an avalanche that had come down near the run-out of “Lust.” They reported that it appeared to have run with some speed and force, as it looked to have washed up over the bank on the observer’s left of the slide path. They observed dirt in the slide path. 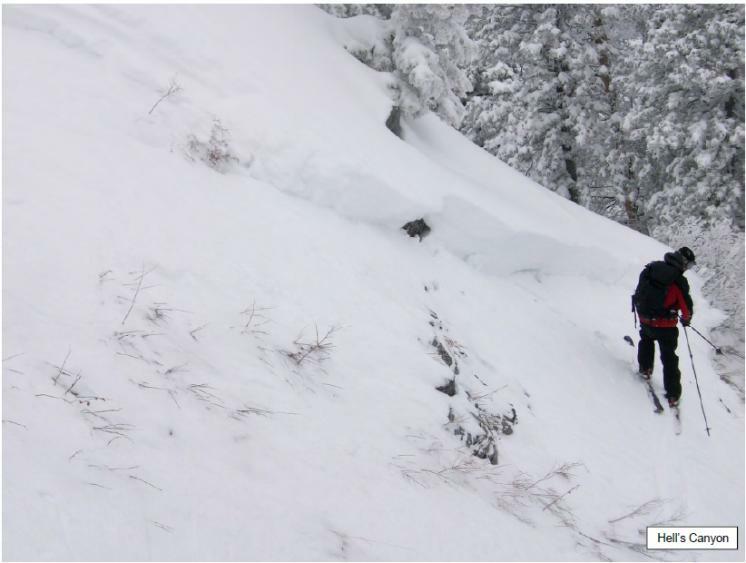 Then they continued down drainage, traversing to the skier’s right of the drainage and debris, attempting to make the traverse back to the ski area They travelled approximately 100 yards past the confluence with “Lust” when Nick spotted a jacket on the surface of the snow. The victim was on their left, down in the bottom of the drainage. Nick skied down first and was immediately joined by the rest of the group. They saw a person (Todd) buried in the snow. He was sitting upright, leaning uphill, with legs bent, almost in a ball. He had his feet downhill and head uphill. His head was covered by approx. 6 inches of snow, but both knees and an arm were sticking out of the snow. He was found at the toe of the debris. They described it like the snow had pushed him along to the very end of the slide. Tony seemed to have a basic understanding of CPR and checked for a pulse. The victim was unresponsive from the start. He did not detect a pulse and the victim was not breathing. At this point they called 911 and the Weber County dispatcher instructed them to begin CPR. They estimated reaching him at approx. 13:20 and made the 911 call at approx. 13:22. They performed CPR for approximately 1 hour. They informed the Weber County dispatcher that they were still in a slide path and likely in danger, but said the dispatcher instructed them to continue CPR. The 911 dispatcher “called it” after one hour and they stopped CPR. A sixth snowboarder (a friend) was riding solo and joined the group at the scene some time after they found Todd. This sixth person stated that he followed approximately the same route as the rest of the group. The victim was described as a male in his mid-40’s. He was wearing a blue jacket, black pants and blue alpine ski boots. No skis or poles were found on scene. Nothing was on his head (no goggles/hat/helmet/etc.). He was not wearing gloves, but they found 2 gloves, approx. 20 feet uphill from the victim. The gloves were black, Reusch “racing” gloves. He was wearing a pack, but one of the straps had been broken. 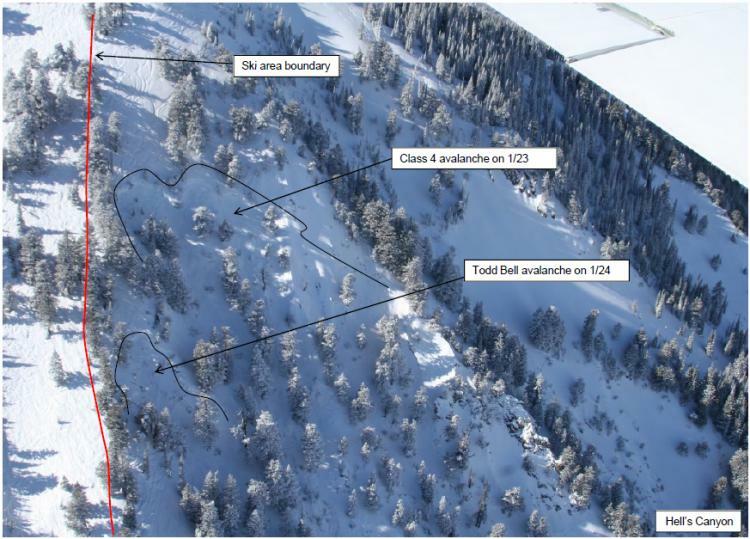 The group did not have a beacon to mark the victim (in case of subsequent slides), but they did make an “X” with branches to the skier’s left of the victim, up on a small ridge, approx. 25-30 yards away, out of the slide path. 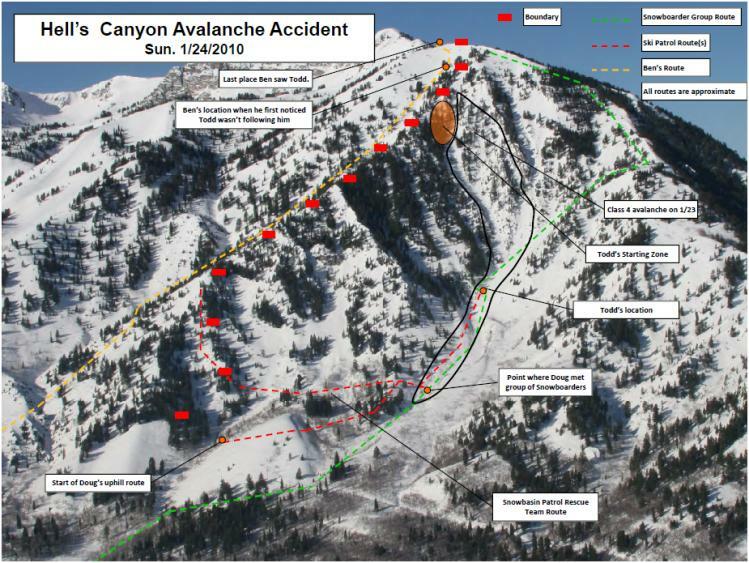 Snowbasin dispatch instructed the group to leave the scene and travel down canyon where Ski Patroller Doug Wewer would meet them. Doug had left the ski area boundary near the intersection of Mustache Ridge and the Dead Deer traverse and traversed to Vanity Face. He skinned up from there and travelled to a small sub-ridge just West of Vanity Face, where he could see the lower Hell’s Canyon drainage. The group informed him that they travelled about 80 to 100 yards down canyon and around a bend before they first made audible/visual contact with each other. Doug dropped into the drainage bottom, met them, discussed the exit plan and escorted them to the power station. They all walked together to dispatch and began paperwork.